I love to tweak things. No matter what I’m making, I’m never able to think about anything else until I’m happy with it’s final result. Especially with this recipe. Luckily, my family’s favourite cake is carrot. I’ve made so many different carrot cake recipes now which I’ve forced them to eat, I’m surprised they still like it! However, I can safely say that I’m now happy with this one. When it comes to my recipes, I don’t like to share multiple of the same thing. So, when I make something better and improved, it’s out with the old and in with the new. So, this recipe has had a transformation. I like to say I’ve given it a make over. Before, I created a round carrot sandwich cake, with a mixed spice frosting. As much as I liked that cake, I knew I could improve on it. 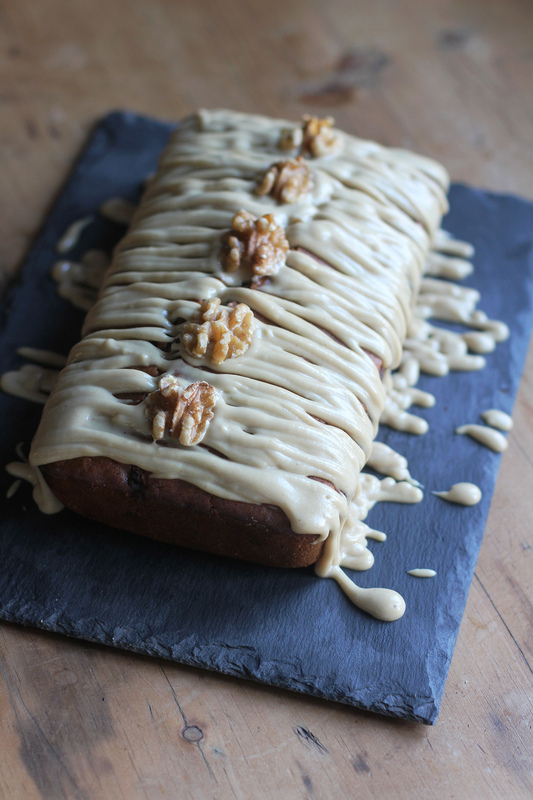 So, I got back to basics, and gave my carrot cake a slight facelift. 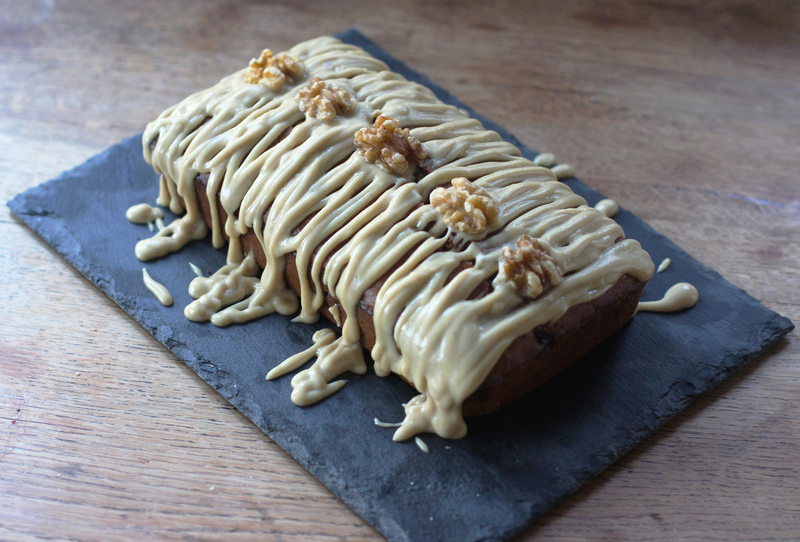 Now, I’m proud to share my refreshing, moist carrot loaf cake. 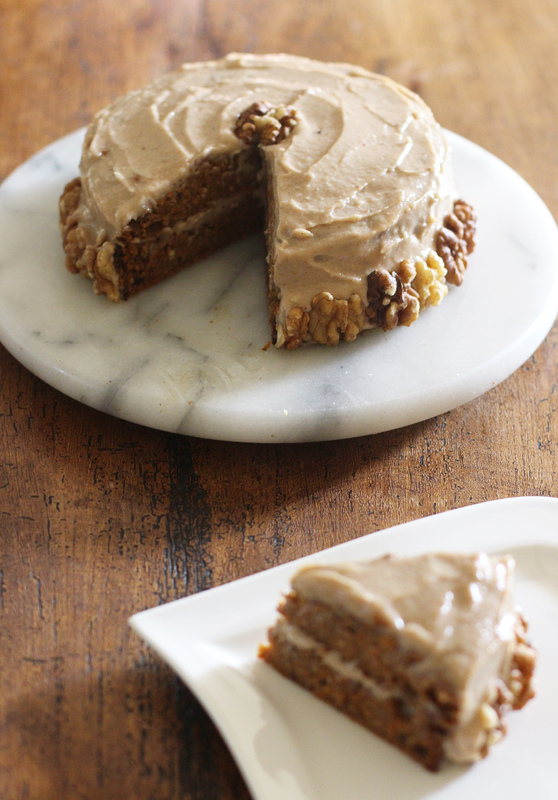 I used hemp oil to give this cake it’s richness, and I also love it as it’s a great source of omega 3! So you can kind of see this cake in a healthy way.. …There is also a carrot in there, so that’s good too, right? To give a refreshing flavour, I used the zest and juices from a lime and orange, which pair perfectly with the cake’s frosting. On to the frosting. It’s really quite addictive. I actually think the frosting would work well separately into a cheesecake recipe – but I will save that for the future. 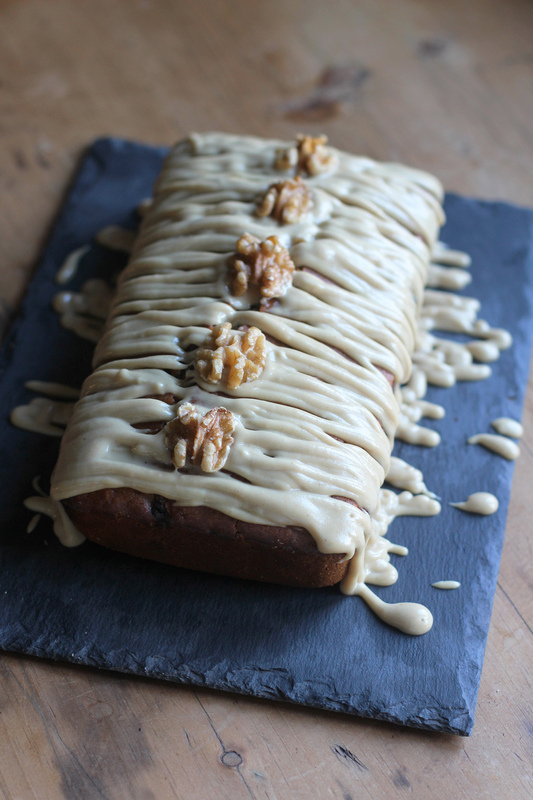 I used orange and ginger to create something that would complement the flavours in the carrot cake, but also add a subtle kick of spice and heat. I love the combination of citrus fruit and ginger, so you can see why I find this frosting addictive. 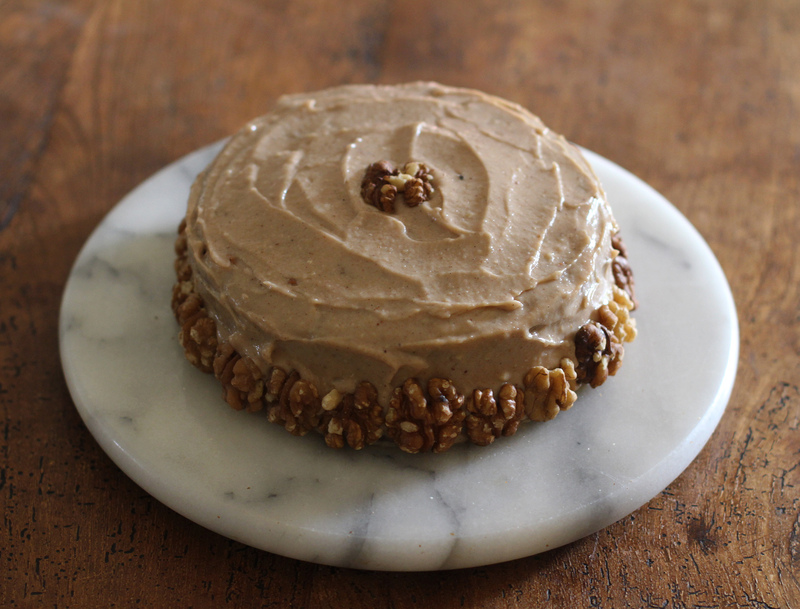 So, to finish the cake, I generously drizzled it with the frosting, and scattered it with walnut halves. Mmm. 1. Firstly, make the flax egg by mixing the flax seeds and water into a bowl, and then setting aside. To allow the flax seeds time to gel, I then also grate the carrot, and set it aside for later. 2. Next, pour the oil, maple syrup, flax egg and milk into food processor. This will look separated, but that’s fine. Then, add in the buckwheat flour, rice flour and quinoa flour, followed by the cider vinegar, bicarbonate of soda, and baking powder. Grate in your lime and orange zest, and then juice them enough to make 1 tbsp lime juice and 2 tbsp orange juice, and add them into the mixture. Lastly, scoop in the mixed spice, all spice, cinnamon and nutmeg. Blend the the entire mixture until a smooth cake mixture has formed. 3. Then, fold in your carrot, raisins and walnut pieces. Scoop the cake mixture into a small loaf tin, and then place into the oven. Cook for about 35-40 minutes, or until the cake has turned golden, and the top has cracked. Check with a skewer that it has cooked through, and remove from the oven. Then set aside, and wait for the cake to have cooled completely. 4. 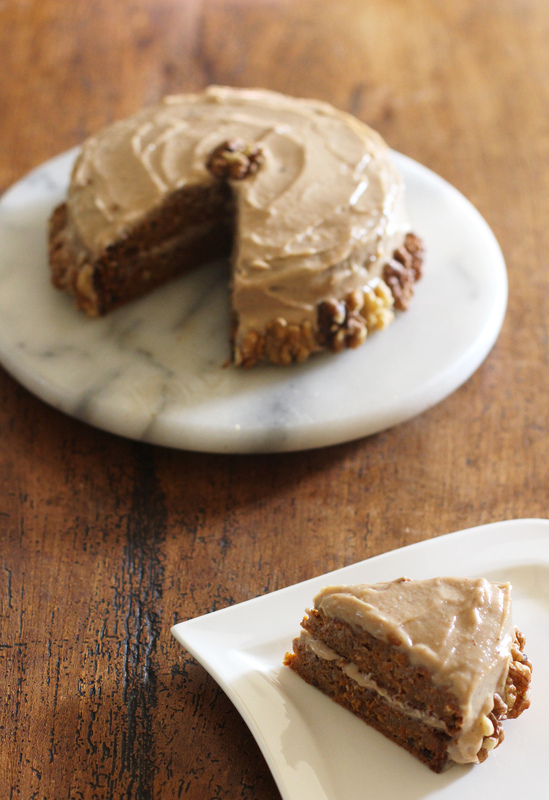 When the cake has cooled, make the icing. Add the cashews, water, milk, coconut oil, orange, maple syrup and ground ginger into a blender. Get your piece of root ginger, and grate into the blender. Blend the mixture together until completely smooth. When this is done, pour the mixture into a piping bag with a small round nozzle. 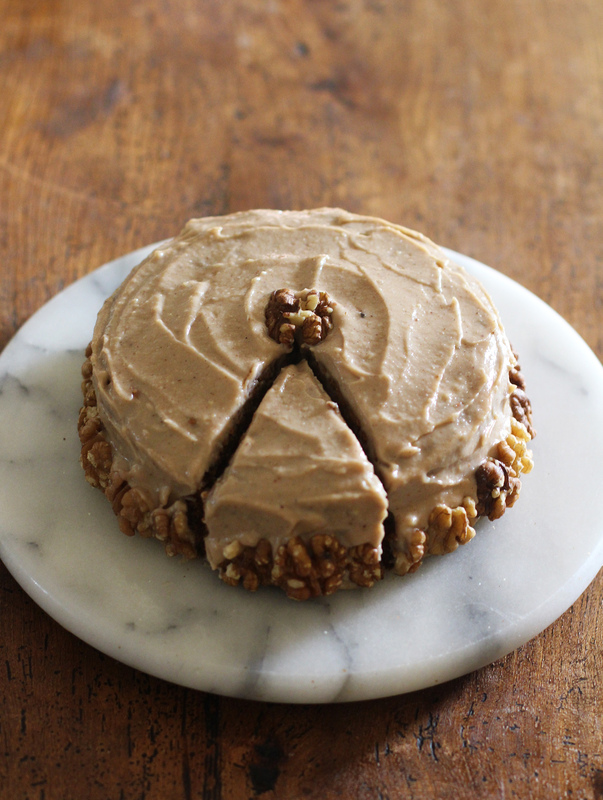 Get your cake, drizzle with the icing, and top with some walnut halves to finish. Alternatively, you can just spoon the icing on top, whichever you prefer. When the cake has iced, slice and eat immediately with the icing still runny, or leave in the fridge for an hour or so, until the icing has stiffened. This sounds so yummy. I want to make it but don’t know what “mixed spice” is? Thank you for the info on the mixed spice. I will check out our local store to see if they have it or not. If they don’t thank you for the link on where to purchase it. I have seen all spice but not mixed spice. Can’t wait to try your recipe! I just saw the link is on how to make the mixed spice. I do have all of those ingredients. I’ve been looking for a cake for my mom’s birthday. This might be it – I’m drooling over here! Can I sub the flax seeds with chia? Hi Mory, I haven’t tried subbing the flax with chai, but you can certainly experiment and see how it goes! Good luck! This looks and sounds amazing . . . love all of the simple lovely ingredients. Thanks so much! I’m so glad you like the recipe, thank you! Ah yay, finding vegan is such a great website! This sounds lovely! Is there a simpler option for all of the flours? I have quinoa flakes, WW flour, coconut flour, AP flour, and can make oat flour, but I don’t have the flours you use here! This looks amazing and have all the flours. I’d love to see how the cake turns out. i’m gonna try it this evening and will give real feedback on the structure, taste and success at a party. thanks again for the lovely recipe. Hi Jeri, thank you so much! Good luck with the recipe 🙂 I hope all goes well and you like it! Do you think this cake would freeze well? I am hoping to make ahead for a Christmas Eve party and then take out and ice the day of the party. I think it should be fine but I was just wondering what you thought. I made this cake tonight and it was phenomenal. I subbed a few things and tweaked a few measurements based on ingredients I already had. I also went to town on the spices, but it was still absolutely perfect. Can’t wait to try more of your recipes, they’re really innovative which I find rare with plant-based cooking. Thank you!